You have created a Power BI data model and want to import the data from Power BI Desktop into Excel? Read on and learn how it works. Read more about Power BI here. With Power BI, a variety of different data sources can be connected and the data can be imported. However, exporting data to other programs is not possible without further ado. Analyzing in Excel, described in the official documentation. Export to csv or txt files using R-script. Read my article here (only in German available). Export to an SQL database using an R script. Read my article here. Import data from a Power BI Desktop file into Excel (this post). Although this feature is not offered out-of-the-box, the data can also be imported from a Power BI desktop file into Excel. And it’s even easier than you thought. The biggest (and only) hurdle is that we need to know the port of the Power BI desktop file. 1. The first step varies depending on the type of installation. 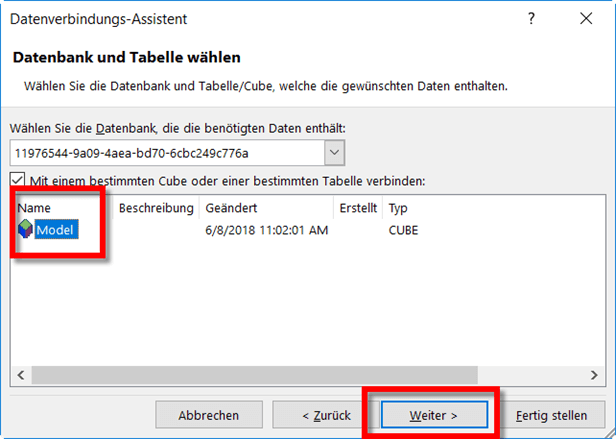 In both variants you can see that the folder is still empty if you have not opened a Power BI Desktop file yet. 2. Next, open a Power BI Desktop file. Once the file is open, you can switch back to File Explorer. 3. Here you see a newly created folder. Open it. 4. Select the folder “Data” and select the file “msmdsrv.port.txt” and open it. 5. You will now see the port number of the Power BI Desktop file. Copy it. 6. Open Excel, go to the “Data” menu item, then “Get Data” (the menu item depends on your Excel version) and select “Analysis Services”. 9. Specify how the data is to be imported. and you will get a fully functional pivot table (all data are fictitious demo data!). If you right-click on a cell in the pivot table, you can drill down to display the first 1000 detail records. Unfortunately, there are a few restrictions in this variant. So far, I am aware of four restrictions. The Power BI file has to be open for the connection to be established and the data to be updated. Do you know any other restrictions? Leave a comment and let us share your experiences. Read more about Power BI here. Dear readers, I write my articles for you. It is my ambition to provide you with qualitatively appealing content. Please take a minute and give me a review or comment below.